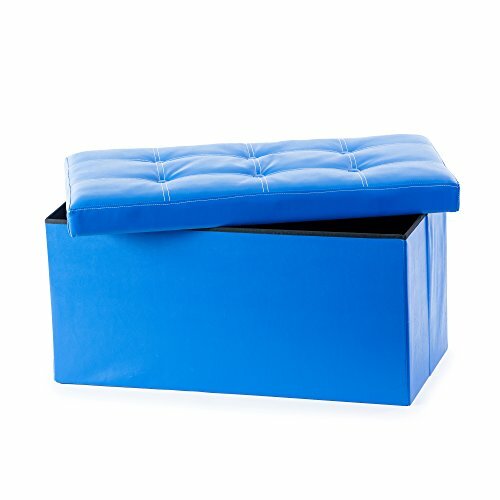 Declutter your home office, bedroom, or playroom with this stylish upholstered bench. It can be used to store books, DVDs, toys, or even shoes. The comfortable tufted cushion top also provides comfortable extra seating for 2 or a footstool. Add a tray over the top and you have an instant coffee table. The bench is covered in easy-care faux leather - simply wipe with a damp sponge or cloth. It comes in an appealing Red, Blue or Black to fit into any room decor. A removable lid reveals a large storage area and an interior storage divider provides extra storage options and stability. Comes with a 1 year warranty. Collapsible seating solution with storage for toys.